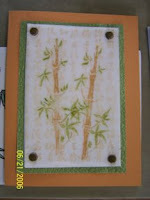 It is a tri-fold with the top folded only to the middle. 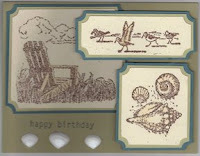 The flower and shells are all die cut (some by a Cuttlebug, some by a Pazzles Inspiration). 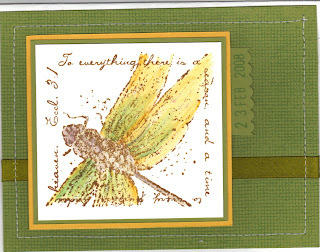 They are all chalked and inked with Stampin' Up inks: Pretty in Pink, Certainly Celery and Chocolate Chip. The edge is punched (punch name unknown) and chalked. 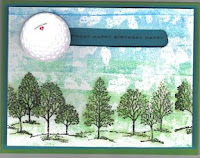 The right side features a pocket to hold the RSVP card and Registry Card. 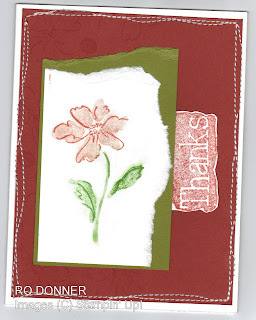 The center is stamped with the hibiscus and leaf from SU's Do the Hula (retired) set, using Pretty In Pin and Certainly Celery inks. 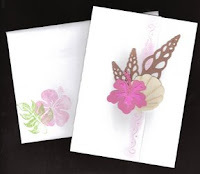 The invitation information is printed on SU's vellum and attached with a Fastenator decorative staple. This picture better shows the punched edge. 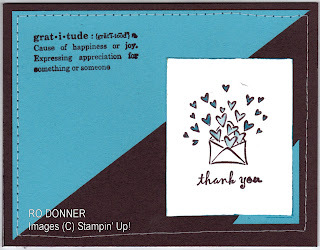 The RSVP card is also stamped with the Hula stamps. I have two of these done. Only 278 to go!!!! And they have to go out in two weeks. Oy! I've been busy working on my daughter's wedding invitations. Will post one of those beauties when they're completed. Thanks to my daughter and future son-in-law, we got a lot of the basic part finished. I did a couple of birthday cards for my father-in-law today. He's a golf fanatic who lives in Florida. One from my husband and I (the spinner card), and one from my DD and her fiance'. Any comments would be greatly appreciated! Here are some of my past card and projects. 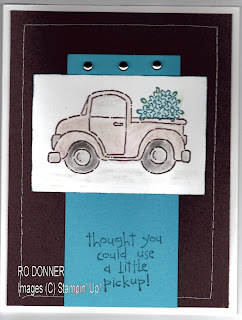 Here are a few cards I did for a recent workshop, plus a birthday card I did for my Aunt's 83rd birthday. Welcome to my new blog. Please bear with me while I construct, change, redo, erase, republish, etc. This is a work in progress.